THE INJURY LADY SAYS: GET MORE CAR ACCIDENT INSURANCE! Have I been in a car wreck? Have I been injured or do I have property damage? Is the person who caused my car wreck uninsured? If you know the answer to these questions, then likely you don’t need to continue reading. However, if you are like most people that come into my personal injury attorney office you may not know what happens next. People are under the mistaken impression that simply because the car wreck is someone else’s fault, that someone else will automatically have to pay for their damages, i.e. their car accident injuries, lost wages, property damage, etc. But who really pays? It is the car accident insurance company that the at-fault party has coverage with, right? So what if the at-fault party has no car accident insurance? You are left having to find some way for the individual themselves to pay for the personal injuries and damages. How well is that going to work out, do you think? How many people on the road are able to write a check to cover those damages? Is it likely that the average person can simply stroke a check to pay you for your car accident injuries, pain and suffering, loss of income, property damage? The reality is, the answer to the last question is…No. The alternative is this: PROTECT YOURSELF. 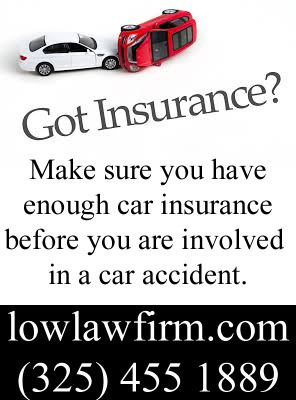 You take the steps to ensure that you provide yourself enough car accident coverage. How do you do that? Well, first you look at your policy and then you get on the phone with your agent! There are several types of car accident insurance coverage available that will help you. When you are setting up your policy or making changes make sure that you consider things like Personal Injury Protection (PIP), Medical Payments Coverage (MPC), and Uninsured/Underinsured Motorist Coverage (UM/UIM). These are additional no-fault coverages that are required, but waivable in the state of Texas. Many of you have probably been asked about these things when you are setting up a new policy or when you are renewing your policies. If you are like me, you probably think it is just another way for the crooked car accident insurance companies to get more of your money, so you reject this additional coverage. DON’T DO IT. Personal Injury Protection (PIP): This is a no fault coverage that you can add to your policy that will reimburse you for time off of work or reasonable and necessary out of pocket medical expenses related to the accident. The amounts vary; I typically see them range from $2,500.00 to $10,000.00 depending on the amount of coverage you choose to pay for. Essentially, the way it works is this: you incur the bill or lose the time at work, you then submit the information to your insurance company and they will send you a check to reimburse you up to the amount of your coverage. Medical Payments Coverage (MPC): This is another type of car accident insurance coverage that you can elect to have added to your policy that will reimburse you or pay reasonable and necessary medical and funeral bills for covered persons under the policy. It works very much like PIP, however, if you receive money from the at-fault party’s insurance you will likely have to pay back what you received from your insurance company under this type of coverage. Given that this coverage requires repayment, this particular coverage is less desirable than PIP, but it is still a great option if the other party is uninsured or you are at fault. Uninsured Motorist Coverage (UM): This is coverage that many choose to reject, but really should be given serious consideration. UN-inusred Motorist coverage provides you with coverage in the event the at-fault party has NO insurance. It is an unfortunate truth…many people choose to get behind the wheel but refuse to maintain insurance coverage. If you are involved in a motor vehicle accident with this person, who is left holding the bag? You are, unless you take the steps necessary to protect yourself i.e. Don’t waive the additional car accident insurance coverage! It is not that expensive and will save you a ton of heartache and out of pocket expense later. Underinsured Motorist Coverage (UIM): The other ugly reality is that most people carry only minimal insurance limits. If you are injured in a car wreck and the at fault party carries only minimal car accident insurance limits then you may still be stuck holding the bag for many of your medical expenses and other damages. This is where UNDER-insured Motorist Coverage becomes important. This coverage is there to help pay for your reasonable and necessary medical bills, loss of income, etc. that are incurred as a result of the car wreck, when the at-fault party’s coverage is not sufficient to cover those damages. Well, here is the answer: Because the person who caused the car wreck can’t and, most likely, won’t if they do not have insurance. As motorists we all have a duty to other motorists, but as people we have to protect ourselves. This coverage is a minimal expense that will save YOU a lot of time and heartache.